Reflecting on the Frankensteinian act that is cinematic creation, this video essay presents a side-by-side view of Ingmar Berman’s Persona (1966) and a reconstruction of it using parts culled from a variety of Frankenstein films. The opening sequence of Persona, a “poem in images,” is a moody montage of startling footage. Intensely personal, these images spell out Bergman’s artistic obsessions: cinema, life and death, religion and sexuality. The sequence is surprisingly horrifying: its imagery is very much akin to what one would expect of, well, a Frankenstein movie. Surely this is a coincidence. It’s a coincidence that Persona’s opening sequence is riddled with images of lifeless bodies under white sheets – resembling Frankenstein’s monster before his reanimation. It’s a coincidence that Bergman shows us how life is breathed into still images by a movie projector, just like lightning breathes life into the Creature. It’s a coincidence that Persona uses the same horror iconography (skeletons, spiders, bloody entrails) that is to be found in Frankenstein films. It’s a coincidence that the religious references in Bergman’s visual poem echo the blasphemous hubris of Victor Frankenstein. But these sure are a lot of coincidences. So many that one could even, say, recreate the opening scene of Persona using only footage from Frankenstein films. Persona [feature film] Dir. Ingmar Bergman. Svensk Filmindustri, Sweden, 1966. 85 mins. Frankenstein [short film] Dir. J. Searle Dawley. Edison Manufacturing Company, USA, 1910. 16 mins. Frankenstein [feature film] Dir. James Whale. Universal Pictures, USA, 1931. 70 mins. Bride of Frankenstein [feature film] Dir. James Whale. Universal Pictures, USA, 1935. 75 mins. Son of Frankenstein [feature film] Dir. Rowland V. Lee. Universal Pictures, USA, 1939. 99 mins. The Curse of Frankenstein [feature film] Dir. Terence Fisher. Hammer Films et al., UK, 1957. 82 mins. Flesh for Frankenstein [feature film] Dir. Paul Morrissey, Antonio Margheriti. Compagnia Cinematografica Champion et al., USA et al., 1973. 95 mins. Frankenstein: The True Story [television film] Dir. Jack Smight. Universal Studios, USA, 1973. 185 mins. Spark of Being [feature film] Dir. Bill Morrison. Hypnotic Pictures et al., USA, 2010. 68 mins. Tender Son: The Frankenstein Project [feature film] Dir. Kornél Mundruczó. Proton Cinema et al., Hungary et al., 2010. 109 mins. Frankenweenie [feature film] Dir. Tim Burton. Walt Disney Pictures et al., USA, 2012. 87 mins. In addition to a slew of classic Frankenstein adaptations, I used footage from two very original takes on Mary Shelley’s source material. Tender Son: The Frankenstein Project is a modern, Hungarian adaptation that uses the Frankenstein mythos to reflect on artistic creativity, on fatherhood and parenting. In Spark of Being, filmmaker Bill Morrison retells the Frankenstein tale using only found footage: archival material which he sourced from various film archives. Morrison, in effect, adopts Victor Frankenstein’s modus operandi as his own, piecing together his movie from disparate footage. I have taken some liberties with the source material, in that I shortened Bergman’s opening sequence. The original is 1 min 45 secs longer: towards the end it features images of the young boy sitting up, reading a book and (most notably) touching a large projection showing female faces. It was difficult to find enough matching footage in Frankenstein adaptations to recreate those images. (Although there are several scenes in various movies of the Creature interacting with his own reflection in water or a mirror that would be fitting. Even some scenes of the monster wordlessly interacting with his maker might serve the purpose). Coincidence or not, perhaps Ingmar Bergman was channeling the Victor Frankenstein that is in every filmmaker. Like Frankenstein’s patchwork brute, a movie is pieced together from disjointed shots, and then animated by light. 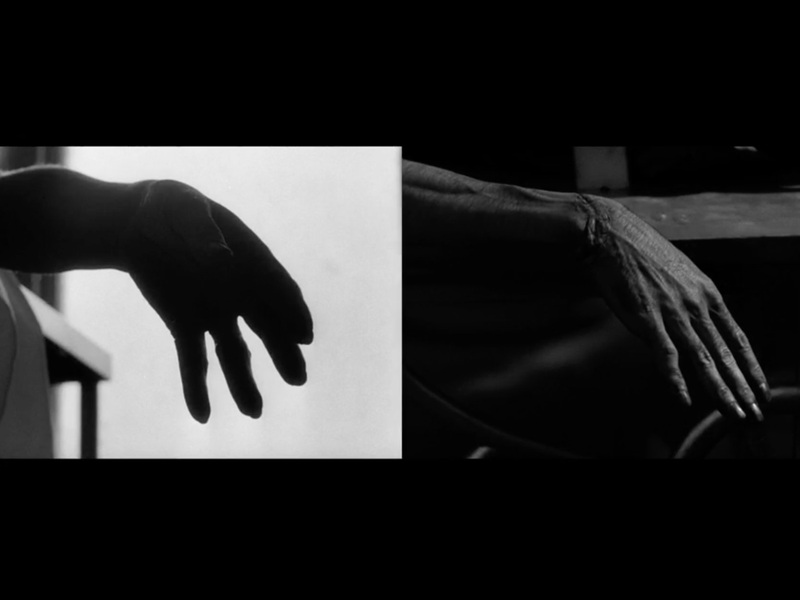 What else is film than resurrecting dead matter: creating motion out of still images? Shelley, Mary Wollstonecraft. Frankenstein; or: The Modern Prometheus. Romantic Circles Electronic Edition. Ed. Stuart Curran. College Park: University of Maryland. https://www.rc.umd.edu/editions/frankenstein. David Verdeure is a producer and director of corporate videos. His Belgium-based production company mainly works for industrial clients, for (local) government authorities and for cultural institutions. He is a guest lecturer in Film Analysis and in Audiovisual Criticism at LUCA School of Arts. Under the Filmscalpel banner, David Verdeure creates and curates video essays.